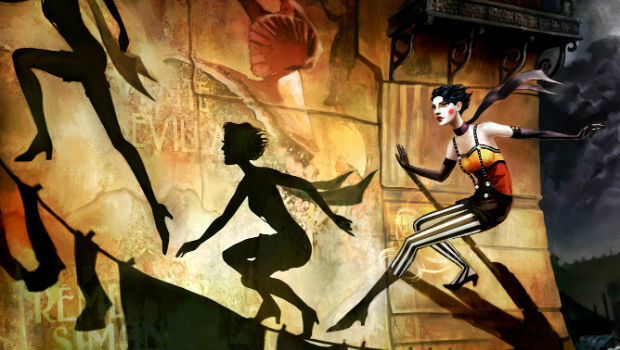 Contrast follows the story of a young girl named Didi and her invisible friend Dawn as they travel through a world of shadows and intrigue. You play through the game as Dawn, a tall acrobatic woman who is considered to be Didi’s “imaginary friend” by the outside world since Didi is the only one who can see her. The game begins with Didi sneaking out of her house to visit the club where her mother, Kat Knight, is performing. With Dawn’s help they are able to watch the performance as well as eavesdrop on Didi’s father Johnny and Kat arguing after the show. This is the first time Didi has seen her father in quite some time as her parents are separated. Didi decides that this time her parents will get back together if only her father could get his act together and stop screwing up. Didi’s father is in deep with some thuggish types and is in desperate need to revitalize his relationship with Kat and Didi. She and Dawn must stay close to him and assist him from the sidelines by fixing his most recent mistakes, such as a flawed circus and blown stage lights during a major performance, so that he can earn enough money to pay of the gangsters and live happily ever after with his family. 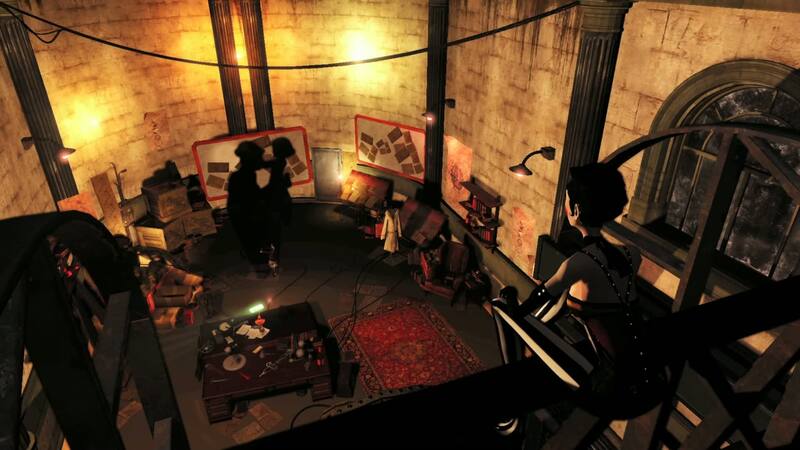 Throughout the game the player sees two sides of the world, the shadow side and the realistic side. Didi is a real living girl to Dawn, for example, but her parents are simply shadows on the wall. The only real character in the entire game from Dawn’s perspective is Didi, everyone else appears in shadow form. Plenty of plot twists and revelations occur during the narrative, keeping you on your toes the entire time. The game is separated into three acts. Each act has a few different sections to it, but overall the game is about five to seven hours in length. 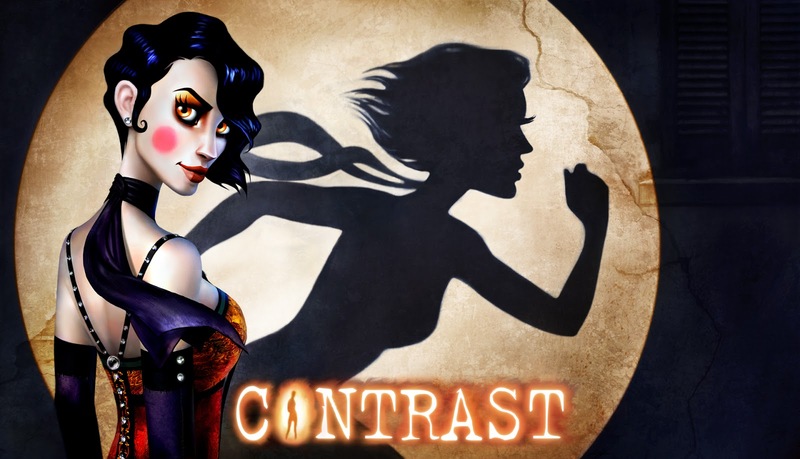 Contrast features and extremely interesting gameplay mechanic: shifting in and out of the shadows. Dawn possess the ability to become a shadow at will in specially lit areas, allowing her to platform across shadows of objects cast on the environment. This creates a two-dimensional gameplay environment as some of the level traversing happens in shadow and in reality, sometimes in the same platforming sequence. There are also plenty of puzzles to be solved in each act of Contrast. Puzzle solving is typically how your get from point A to point B and there is a lot of platforming in between. This seems like a fun concept but when you consider how many glitches the game has, it can get rather frustrating. There are random points in the game in which Dawn will stick onto something like a box or an overhang in the environment causing her to float in the air helplessly while leaving the player out of control of the situation. There are also times where your platforming attempts will fail regardless of how well you timed a jump since at random times things will not connect as they should. These flaws can become rather cumbersome but they do not necessarily affect the overall gameplay experience in a negative way. The world of Contrast hosts a very noire/1950’s Americana feeling. From the buildings and structures to the music played to lettering on posters, this game really fits into the “art deco” era. The atmosphere is arguably one of the best aspects of the game. The illusions, the cabaret and live jazz all mix together to create a dazzling environment. The developers did a fantastic job of reeling the player into the environment of the game. Contrast is breathtaking in many aspects but falls short in a few key areas. The narrative can be convoluted at times, bugs and glitches make the gameplay an annoyance at times, and the game itself is rather short. Despite all of those seemingly bothersome aspects, I found playing the game to be a rather fun and charming experience. *Note: A patch is to be released in the coming days for all console version of the game, a PC patch has already been released. This is supposedly going to clear up many of the bugs and glitches I previously mentioned. For more information, check out the patch notes.